Rob Kiser|Call Photo Chloe Stewart flies down the court for Piqua earlier this season. The Lady Indians have not played a game since Jan. 9. Rob Kiser|Call Photo Piqua’s Kenzi Anderson drives to the basket against Trotwood-Madison earlier this season. Piqua hopes to get back in action Wednesday. 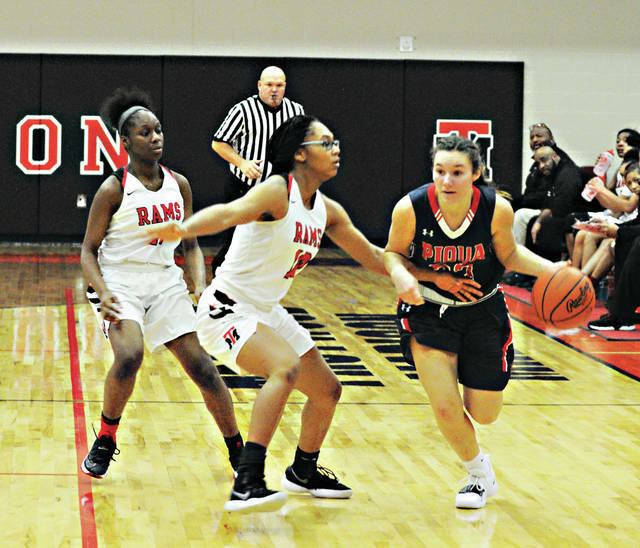 Rob Kiser|Call Photo Coach Jon Dolph and the Piqua girls basketball team is hoping to get back into action Wednesday. No basketball coach is happy with the recent rash of bad weather forcing game postponements —- creating the dilemma of trying to reschedule games and still be sharp when the tournament season starts. But, no team has been affected more by that than the Piqua girls basketball team and coach Jon Dolph. The Lady Indians are in the middle of a breakthrough season —- having reached double digit wins for the first time in 18 years. Piqua went to 10-4 after a win over Xenia on Jan. 9, the last time the team donned their game uniforms. The last time Piqua won that many games was the 2000-01 season, when Piqua finished 13-10 and advanced to the sectional finals. It was also the last time the Lady Indians won a tournament game. And while Piqua was scheduled for a 10-day break after Xenia — that was not a bad thing with Tylah Yeomans working her way back from an ankle injury and Aubree Schrubb out injured —- but, after Saturday’s game at Fairborn and Monday’s game at Bethel were cancelled, the time between games will have stretched to 14 days when the Indians host Stebbins Wednesday. He admits the time off from practice is good in one way. Dolph knows his kids are looking forward to playing a game. “They want to give somebody else some bumps and bruises,” he said with a laugh. “I live in Dayton. The roads aren’t great, but I know Fairborn and Stebbins are probably practicing. I am just hoping to be able to practice on Tuesday and then get the game in with Stebbins Wednesday. And he hopes that he sees the team that has built up momentum as the season has gone on. And Dolph is just hoping continue the team’s momentum —- whenever the “second season” finally gets started. Games that have been rescheduled recently include Lehman Catholic boys at Hardin Northern, Jan. 28; Newton boys at Houston, Jan. 28; Bradford girls at Arcanum, Jan. 29; Lehman Catholic boys at Sidney, Feb. 4; Covington girls at Ansonia, Feb. 4; Arcanum girls at Versailles, Feb. 5; and Bradford boys at Parkway, Feb. 18. Games that have yet to be rescheduled include Piqua girls at Bethel; Piqua girls at Fairborn; Mississinawa Valley girls at Lehman Catholic; Covington boys at Houston; Covington girls at Greenville; and Russia girls at Anna. FORT LORAMIE — On girls basketball game was played last night with Houston girls losting to Fort Loramie 69-18 in SCAL action. Fort Loramie improved to 15-1 overall and 9-0 in the SCAL, while Houston dropped to 7-10 overall and 4-4 in the SCAL. Houston will host Anna Thursday. https://www.dailycall.com/wp-content/uploads/sites/30/2019/01/web1_chloe-6.jpgRob Kiser|Call Photo Chloe Stewart flies down the court for Piqua earlier this season. 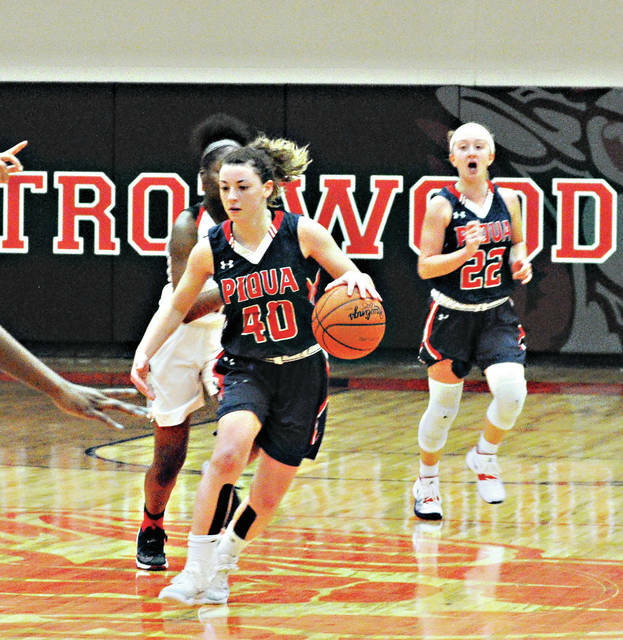 The Lady Indians have not played a game since Jan. 9.
https://www.dailycall.com/wp-content/uploads/sites/30/2019/01/web1_kenzi2-1.jpgRob Kiser|Call Photo Piqua’s Kenzi Anderson drives to the basket against Trotwood-Madison earlier this season. Piqua hopes to get back in action Wednesday. 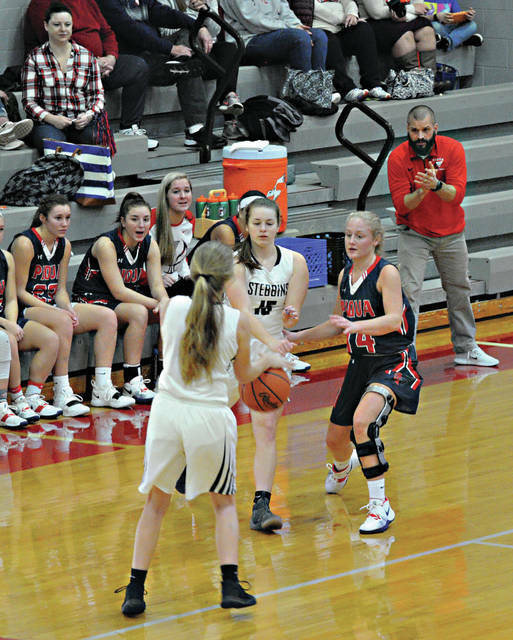 https://www.dailycall.com/wp-content/uploads/sites/30/2019/01/web1_hailey-6.jpgRob Kiser|Call Photo Coach Jon Dolph and the Piqua girls basketball team is hoping to get back into action Wednesday.